Sage tea has a gypsy folklore reputation for darkening gray hair, and I can personally attest to the fact that it works. The effect is gradual and undramatic, your hair looks darker, without showing any ugly grey roots. 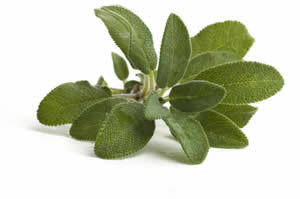 Sage also leaves the hair feeling soft and shiny, and the scalp invigorated. This is also a good treatment for ringworm in pets and people. For ringworm infections, thoroughly soak your animal companion with a strong, cooled sage tea twice daily. Put a few good handful of garden sage, or 4 tablespoon of dried sage into a pot and pour over with half a pint of boiling water. Add a teaspoonful of borax and allow to get cold. Add a few drops of sage essential oil to intensify the effects. To use, damp a brush or sponge in the "tea" and apply lightly to the hair, or keep a squeeze bottle in the shower and apply to wet hair, don't rinse.